- Select Event - No upcoming events found! Can you afford to slow down production because your color system is down? The first step on the path to success using a spectrophotometer and color related software is making sure that all your operators know and understand how to operate the system. 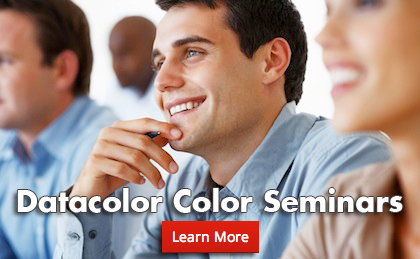 Datacolor customers tell us that support and expertise is critical to get the best results out of a color system. To meet the diverse needs of all our customers wherever they are located, we have created several application Services. These services give you expert level technical support, customized training, educational programs and best practices to meet your individual needs. Global companies can expect the same level of support wherever they have facilities. Our Basic Support includes up to 15 minutes of live phone support (per incident) and unlimited access to the Datacolor Support website. On this site you will find answers to most of your questions and video tutorials showing you how to operate our software. Live Web and telephone support eliminates the need to spend extra travel time and expense for training, configuration setup or problem resolution by allowing our Applications Specialists to take control of the system from a remote location. Employees with little experience in areas such as color development, quality control, research and development, design will benefit from this service offering. If you cannot afford downtime you need this package. Your choice of applications support services described above, including on-site, or in-house support. Employees with no or little experience in areas such as color development, quality control, research and development, design will benefit from this service offering. If you cannot afford downtime you need this package. *Besides above offerings, application support can also be bought on an hourly bases. Application ServicesClick here for Datacolor's Applications Services Brochure (PDF File). Hardware ServicesClick here for Datacolor's Hardware Services Brochure (PDF File). Application Services (Chinese)Click here for Datacolor's Applications Services Brochure - Chinese (PDF File). Hardware Services (Chinese)Click here for Datacolor's Hardware Services Brochure - Chinese (PDF File). Teamviewer SoftwareClick here to download the full version of TeamViewer Datacolor utilizes TeamViewer for customer support.